Nightclub bouncers can be very tough dudes. Which is exactly why they are hired for that position. It’s best not to cross them or get them angry. And that’s a lesson two club-goers in Nottingham, England, learned just a bit too late. 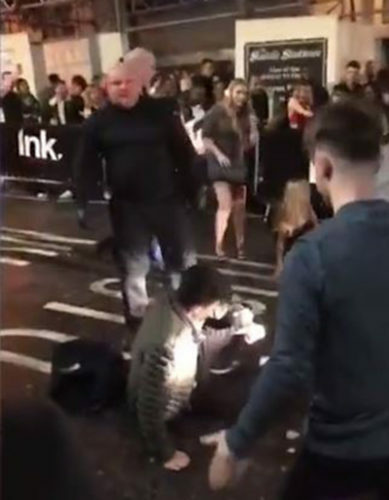 It happened after a student event at Ink, a nightclub located in the center of the city. Out in the street in front of the club, a huge burly bouncer was seen and recorded punching two different men. Some sort of fight broke out and the bouncer becomes involved. He punches one man at least three times, the customer apparently not learning his lesson the first time he was hit. He came back for more two times and on the third punch ended up unresponsive and prone on the street. Another man who went after the bouncer following the first punch to the seemingly unconscious man, also got clocked but good. In fact, the video shows this bouncer has a powerful punch that simply renders all comers defenseless. 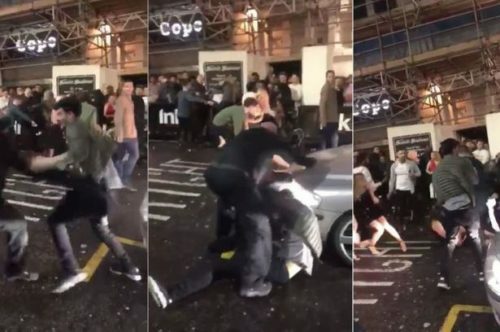 Although the cause of the altercation is unknown, the results are obvious; two guys who made the foolish decision to engage with a hulking security guard who was far too much for them to handle. The crowd surrounded the men who were injured and someone suggested calling 999, the police emergency number. But apparently the police were never called by either the club, the bouncer, the victims or the crowd. People who have imbibed too much often think they are tougher and more lucid than they are. Whoever started this fight bit off way more than he could chew, and got his teeth rattled for his trouble. Beer muscles are big, but real muscles are bigger. Hopefully these two learned their lesson. Better to behave and follow the rules. Especially if you’ve been drinking alcohol. That’s the best way to avoid getting punched. Now that the whole world has seen the video, maybe they’ll think twice next time.